Astigmatism is a condition that causes blurry vision because the cornea is incorrectly shaped. A normal cornea is domed shaped and allows light to focus perfectly on the retina forming a sharp image. 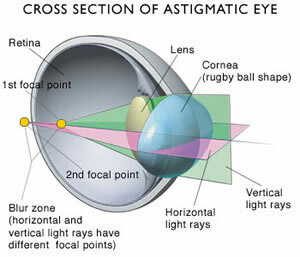 In astigmatism, the cornea is oval shaped which cause light to refract when entering the eye resulting in an inaccurate focus on the retina and a blurred image. Astigmatism can affect both eyes or just one. While the condition causes blurred vision of objects both near and far it can also be accompanied by myopia or hyperopia. Conventional treatment of astigmatism involved the use of eyeglasses or contact lenses. LASIK (laser-assisted in situ keratomileusis) or laser eye surgery is now becoming more common for the correction of astigmatism. LASIK can permanently cure mild forms or astigmatism but follow up surgeries might be required in more advanced forms. The kind of treatment you undergo for astigmatism will depend on your individual condition. You will first need to consult with a qualified ophthalmologist to ascertain if you are a good candidate for bladeless LASIK for astigmatism. The doctor will evaluate your condition and inform you of your best treatment options. During the procedure, a cool laser beam is used to correct the shape of the cornea. If the cornea is protruding the laser will flatten it slightly and if it is too flat the laser will be used to improve the curvature. Once LASIK has restored the cornea to the perfect shape, vision will no longer be blurry and most patients are permanently cured. You will no longer need glasses or contact lenses after the procedure. Who is a good candidate for iLASIK for astigmatism? - You are over the age of eighteen and your refractive error has stabilized. - Your condition is within a certain range and not too severe. - You do not have any other medical condition that could pose a risk to the procedure. Be sure to give your doctor your full medical history before you undergo any procedure. LASIK for astigmatism takes only about ten minutes for each eye. Recovery time might take up to 48 hours after which time you should be able to resume normal activities. Your doctor will prescribe eye drops during this time and will call you in for a follow up visit. It could take a month or two before you experience the full results of the surgery.